We all have heard the saying, “Failure is the mother of success.” But, how many of us prepare ourselves to fail and to fail well? In this month’s Failure x Design, we invited three amazing entrepreneurs to share about their past failures and where they are now because of them. Steve Cronin, Signature Prints – As a veteran CEO who led critical change processes and built successful businesses, Steve faced his biggest challenge in 2009 pivoting a printing business into data-marketing. He stepped down from his CEO position a few years after, when he couldn’t convince his team to embrace the new direction and was compounded by the the economic down turn. 8 years later, Steve moved to a competing printing business where he has found a new home for his ideas. Learning from his failures, he has introduced his disruptive ideas differently and is slowly converting his toughest critics. Keno Mullings, Tech Bootcamp and The Mullings Group – A brand new American citizen who immigrated from Jamaica, Keno put himself through college and jumped head first into a predominantly white tech industry. As a black man in tech, he overcame adversity through unwavering self belief. Kirtley Fisher, RI Department of Education – Prior to her role at the Department of Education, Kirtley was the Experience Design Leader at the nonprofit Business Innovation Factory. She shared her story of a community engagement project that brought the community hope and excitement, but due to a changing circumstance their client decided to pull the plug. She led us in a discussion around the things we do that are helpful (and not) to the people we are trying to serve. Why do we do Failure x Design? 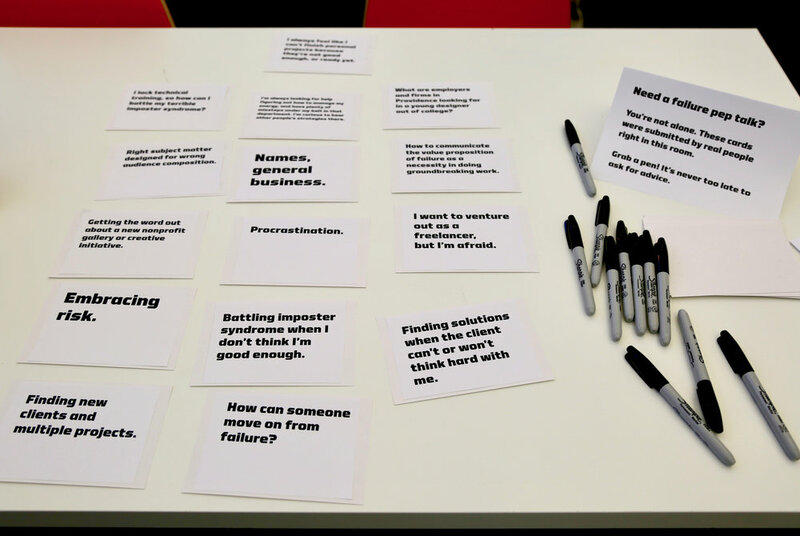 We started Failure x Design to explore rejection and failure as part of the creative and entrepreneurial process. It is a discussion around the key lessons learned from failures and the important soft skills that are often overlooked. As designers we often lean on our technical skills, comparing our work with others. However, what separates good designers from great ones are the soft skills required to wield influence and convince others that your vision is worth taking a leap for. As a company, Giant Shoulders is made up of creatives and entrepreneurs who believe in making the world a better place, and we need more than technical skills to make that happen.